The SpecCam 4 hyperspectral camera uses real-time imaging infrared (IR) spectroscopy to identify and produce semi-quantified mineralogy from the surface of rock cores and cuttings. The acquisition of a continuous dataset allows for the production of mineral distribution maps to spatially understand the impact of clay, carbonate or alteration minerals for the geological assessment of oil and gas reservoirs or mineral exploration sites. Hyperspectral IR spectrometry differs from other point sensor technology, such as the ASD Terraspec 4, by providing full spectral information across the core and down the full core length whereas the point measurement only provide information on discrete areas. The SpecCam 4 hyperspectral camera is available on any of Geotek Multi-Sensor Core Logger (MSCL) platforms (MSCL-S, MSCL-XZ or MSCL-XYZ) and now uniquely offers the ability for users to acquire hyperspectral datasets alongside XRF, magnetic susceptibility, VIS and UV core imaging, and even density/porosity, P-wave velocity or spectral natural gamma all on one core logging platform. Very Near Infrared (VNIR) and Short-wavelength Infrared (SWIR) reflectance spectroscopy measures the vibrational bonds of molecules and their overtones, seen as absorbtions in reflected light. Both crystalline and amorphous minerals (including hydrocarbons) can be measured. The exact positions and shape of absorbtions provide important information on precise composition, crystallinity and quantity of the mineral. Fully supported interpretation software with customisable spectral libraries are offered with each system to process and interpret the spectra. These libraries are built from proprietary and public domain databases with specific minerals added to suite the application. Hyperspectral VNIR/SWIR technology generates near continuous data over the entire surface of whole, split/slabbed core samples, plug and chips. 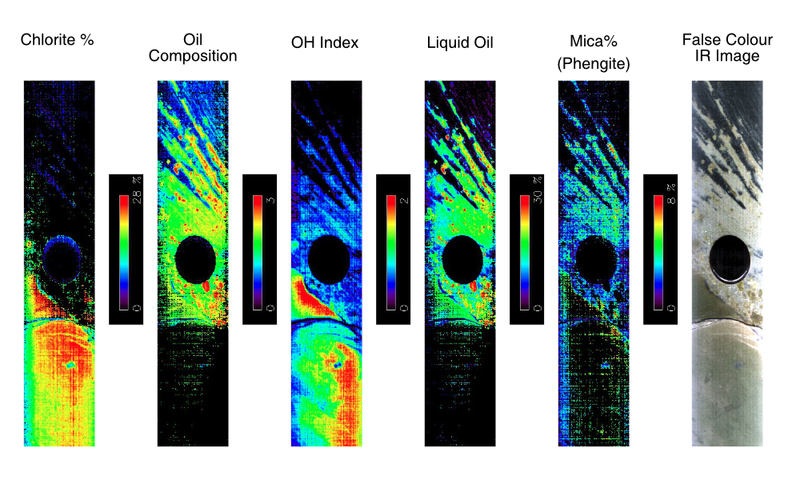 Every pixel in a hyperspectral VNIR and SWIR image contains an infrared spectrum which is interrogated using specialist interpretation software to identify, quantify and map: specific mineral types, mineral chemistry, zones of mineral alteration, liquid and solid hydrocarbons, and contaminants. 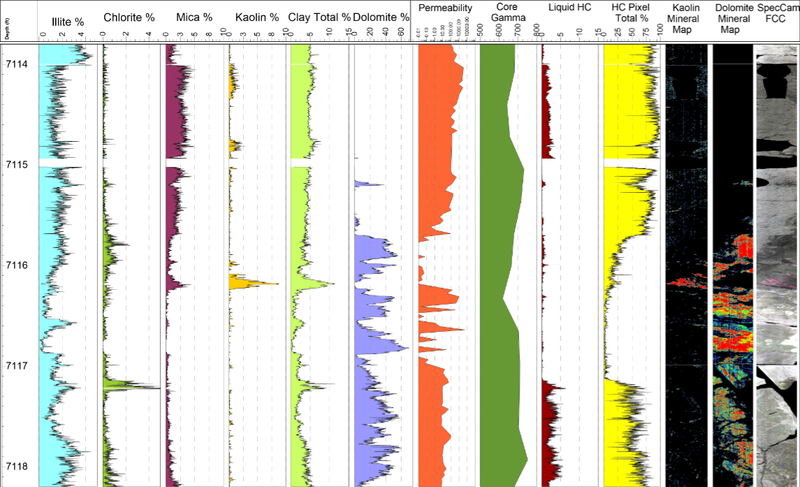 The subsequent mineral maps and mineral composition logs created from these data will enable geoscientists to more confidently determine the interrelationship between mineralogy and a rocktype’s physical and chemical characteristics, thereby improving the lithological description and stratigraphic correlation of geological formations. State-of-the art optical dispersive filter with spectral supersampling tunes to specific wavelengths for better mineral discrimination and identification. Maximum spectral resolution in SWIR is 1 nm at 2200 nm. The MSCL-XZ is a benchtop or small-footprint core logging system that provides a compact solution for split and whole core non-destructive measurements, obtaining multiple data sets simultaneously. 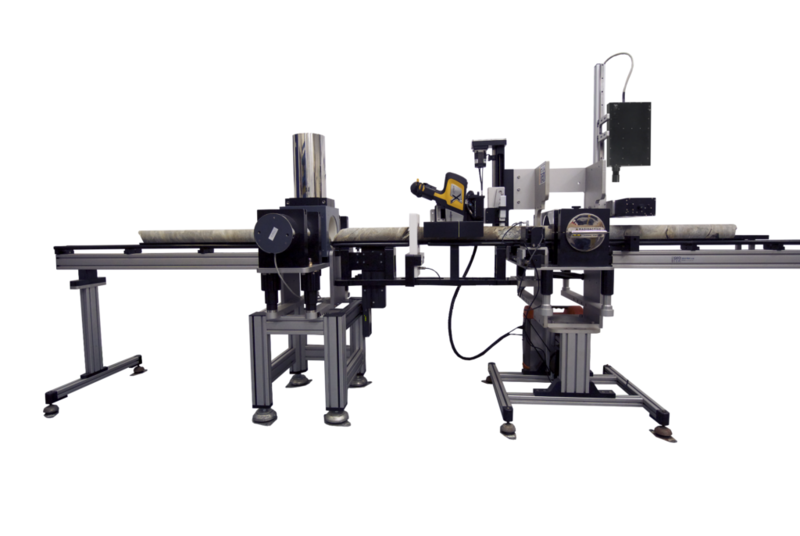 The Geotek Core Workstation (MSCL-XYZ) is a unique automated multi-core logging system that can be combined with XRF, core imaging and various other surface core measurements. Multiple core sections (up to six 1.5 m core sections), or core boxes are loaded into the workstation, which are then logged in a single operation.